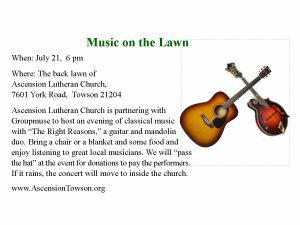 Ascension Lutheran Church is partnering with Groupmuse to 110st an evening of classical music with “The Right Reasons,” a guitar and mandolin duo. Bring a chair or a blanket and some food and enjoy listening to great local musicians. We will “pass the hat” at the event for donations to pay the performers. If it rains, the concert will move to inside the church.